Overlooked both in his day and in ours, he led men firing rifles, a new weapon, to the great distress of the British. More importantly, Morgan won the Battle of Cowpens which in many ways was a turning point in the American Revolution. His efforts that day have been noted as one of the only truly original tactical strategies created by anyone in the war, on either side. The first thing I noticed when reading about Daniel Morgan is that he is cousins with the much more famous Daniel Boone. Like Cousin Boone, Daniel Morgan was a frontiersman who is not given enough credit for his role in the American Revolution. Unlike Boone, Morgan is not a legendary folk hero. Morgan had military experience from his time serving in the French and Indian War. The State of Virginia remembered this when they chose him to command a group of 100 men. ‘Morgan’s Riflemen,’ as they came to be known, were experts at guerrilla warfare under Daniel’s leadership. The Riflemen used, well, rifles, which at the time was a new weapon. It shot more accurately at long range than the standard musket because the inside of the barrel was curved. This put a spin on the bullets. Think of a bullet like a football which can be thrown much farther if you put a spiral on it. Morgan and his men took up the habit of ‘harassing’ the British instead of meeting them head on. They would shoot at the redcoats from a safe distance in the woods, targeting Native American guides first and Officers second, leaving the men stranded and confused. While the British considered these tactics dishonorable, Daniel Morgan didn’t care. He wasn’t fighting for honor. He was fighting for freedom. Morgan led the Riflemen north to Boston, where they helped General Washington in the siege of that city. They then accompanied Benedict Arnold north on his treacherous trek through Maine to fight in Quebec. There they met up with Richard Montgomery and partook in a failed invasion of that city. Morgan followed this by joining the Northern Department of the Continental Army under General Horatio Gates in the momentous Battle of Saratoga. Unfortunately, Daniel Morgan was not a man for politics. By the summer of 1779, after four years of war, Morgan realized he was being passed over for promotions. These offices were given to less able men with better political connections. Daniel resigned his office and returned home. 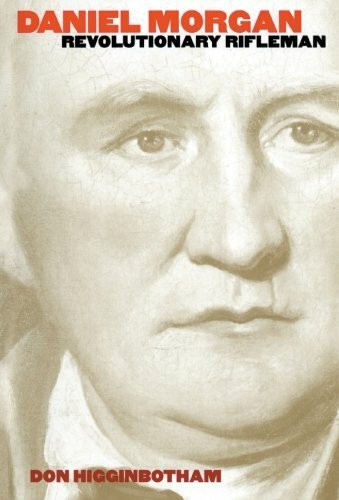 After a year and a half of retirement, and General Gates’ loss during the Battle of Camden, Morgan was convinced by the Continental Congress to return to action. He accepted and was promoted to Brigadier General. Morgan headed for North Carolina where he served under Major General Nathanael Greene. Greene made the unusual move of splitting his army into two parts. Greene led the larger force north to Virginia, with the majority of the British Army following behind. The second part of the army he placed entirely under the control of Daniel Morgan. Morgan moved to the frontier of South Carolina. His goal was just to harass the British and Native Americans in minor skirmishes, however, he found an opportunity to engage the redcoats head on. When Daniel Morgan engaged the British at the Battle of Cowpens, he used a bit of trickery. First, he broke his men into three groups: The Riflemen, the Militia and the Continentals. He put his Riflemen up front, picking off opponents as they approached. Then, when the British came too close they retreated. This was to give the impression they were afraid and embolden the enemy. Meanwhile, they were actually taking a rest to resume fighting later. After the Riflemen disbursed, the Militia stepped forward. Now, both sides knew the Militiamen were untrained and scared easily. So Morgan used this to his advantage and had the Militia run away fairly soon after the Riflemen. The British soldiers, surprised by how easily they were winning the battle, became disorganized as they followed the Militia. Suddenly, the Continental soldiers appeared and were ready to fight. By this time, both the Riflemen and Militia had made their way back into the Battle and overwhelmed the British. This encounter is hugely important to the American Revolution because, while the most of the British soldiers were chasing Nathanael Greene to Virginia, the best British soldiers where fighting Morgan in South Carolina. Less than a year later, with the British severely weakened by the loss at Cowpens, the Americans would win the war at the Battle of Yorktown. Seeing as you read this far, I'm guessing you enjoy the subject matter of this article. If so, PLEASE, leave me a comment and tell me what you think. This is still a new website and I am trying to make it as appealing to you, the reader, as I can. Tell me what you think! If you would prefer to get my articles via email you can do so here. As always, I am recommending a book: 'Revolutionary Rifleman.' All purchase go through Amazon and, while I will get a commission, it does not effect Amazon's.